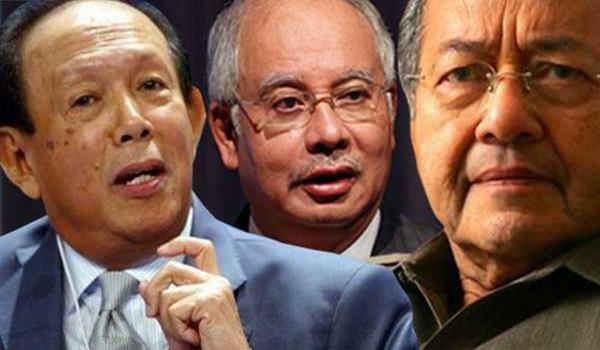 Prime Minister Datuk Seri Najib’s determination to cling onto power despite being criticised from all sides shows he is a very good student of his most vocal critic, Tun Dr Mahathir Mohamed, said Tun Musa Hitam. Musa, who served as Umno’s number two when Dr Mahathir was in power, said the former prime minister had similarly refused to admit to any wrongdoings and remained unfazed by the criticism that dogged his tenure. “You can read the blogs, they call him (Najib) all sorts of name. And I must say this even if some people might not like it: it’s amazing how Najib seems to be taking it so calmly,” Musa told The Malaysian Insider in an exclusive interview at his home. Musa recalled how Dr Mahathir, at the height of his power, had told Musa that admitting a mistake was a sign of weakness that would allow their opponents to exploit them. “Dr Mahathir never admitted to his mistakes, and Najib is learning from Dr Mahathir rather than me,” said Musa, who has known the prime minister since Najib was a young boy. He said the Umno president had failed to provide a satisfactory response on 1Malaysia Development Bhd (1MDB) and the RM2.6 billion “donation”, and seemed to be looking for ways to evade the topics rather than come clean with the public. He said the Umno general assembly next week was the perfect platform for Najib to be completely transparent on those two issues. “This is the chance for the president to really come clean. And I dare say that the president, if there are many issues that he might have discovered to be a mistake, (he should) just say ‘I’m sorry, it was a mistake’. “It’s as simple as that, especially within the context of Malay tradition and our religious teaching. We are ordinary human beings, of course we will make mistakes,” Musa said. The Malaysian Insider: What are your views on the coming Umno general assembly? Musa Hitam: This is the most important and challenging assembly in history. Not just the party’s history, but the country’s history. Because for decades since Merdeka, Umno means power, and power means Umno. But right now, Umno looks like it is in a huge turmoil. Why do I say that? First, because there are many issues the country is facing, such as 1MDB, the ‘donation’ to the president, the serious feud between Dr Mahathir and Datuk Najib, the sacking of the party deputy president and one of the vice-presidents from the government, as well as the sackings of several grassroots leaders. The general assembly must focus on these issues because it has captured the interest of not just Umno members, not just the Malays, but the public at large. All of them are interested, and in a negative way. The perception towards these issues are negative. Secondly, there is talk that there is a proposal to change the assembly’s procedure, which clearly threatens freedom of speech and the party’s openness. This is a tradition that is highly looked up to by its members and praised by the general public. Third, the erosion of the credibility of the leadership, which has negative implications on the party in the eyes of the public. TMI: But it’s been confirmed that the deputy president will not be opening the wing’s assemblies. Musa Hitam: I heard through reading and speculation, the deputy president is not going to be allowed to even open the wings. Way out, way out of tradition, way out of our practice which has proven to be useful in our history. Because the deputy president speaks, then the people can debate, they can even challenge him, they can criticise him, the deputy president. The younger generation in the party can go through a process of self-criticism on what’s wrong with the party. That’s what I mean about openness. TMI: What do you think of the response of the leadership towards the issues you mentioned? Well then, we are living in a make believe world. Seriously. We are evading. And these are not the hallmarks of a party in power. Maybe, if this goes on, it is a party getting out of power. On the way out of power. And I’m not saying anything controversial at all. Everybody’s talking about it, when you go drink coffee, play the gasing, go kite-flying, play golf, play tennis, attend tea parties, birthday parties or weddings…. These are the issues. No way we can avoid it. And we must take the Muhyiddin issue and Dr Mahathir’s attacks as a blessing. It gives us a chance to become a responsible party. Who raised the issues? Muhyiddin. Who is Muhyiddin? The party deputy president. These issues are not racial at all. They’re not based on race at all. These are national issues. I repeat, no way can we avoid it with justification. No way can we argue that it has no relevance to the party, no relevance to the nation. I would say, ‘Come on, man, you can’t be like that’. TMI: Won’t raising the issues divide the party? Musa Hitam: Accept the reality and the very serious necessity to thrash these issues out among yourselves, to discuss this. But here comes the punchline: It should be managed in a democratic way. Democracy demands discipline and orderliness. If there are organised booings, then you create your own trouble. You may be happy to see that fellow, but you should cry because by doing that you are destroying the party. TMI: Would placing these restrictions at the assembly benefit Najib, maybe ensure his political survival? Musa Hitam: You can be a brilliant politician, but that doesn’t mean you are a positive politician. You may be brilliant, but you may be destroying the party and even the political system in the process.